Our “Giant Pans” are equally at home inside or out. Each dish is prepared and cooked from scratch in front of your guests. We do not cut corners. 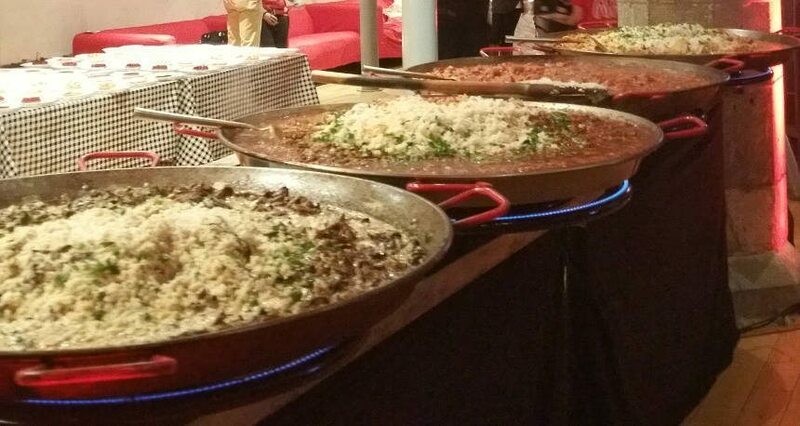 The cooking process can be quite a spectacle and we like to think of it as a piece of food theatre and guarantee it will add to the atmosphere of any event. This is why we describe our service as “food with atmosphere”. If you’re having a larger party they create quite an impression lined up side by side. The minimum number of portions we can cook in our smaller pans is 30, vegetarian dishes excepted. To cater for vegetarians in your party we can if you wish create just one serving. Our largest pan if you want it can serve up to 200 people. We have the equipment and staff if you wish to cater for a thousand people or more. One chef can look after two pans and is included in the price quoted. If you wish to book 3 different dishes or more you’ll need and extra chef for each additional 2 pans and for each extra chef we charge a straight £70. The burners are gas and we are completely self contained, we say to all our clients that once booked all you have to do is relax! The only thing we may need is an electrical socket to plug in our lighting when conditions require. If you’re having an upbeat event we even have moody coloured lighting which can be set to your liking. In short let us help add to the atmosphere whilst you relax and enjoy your party.